How to have fun with one of humankind’s first ever group activities, at any level. Everyone expects children to sing. We seem to think it's important enough to set aside time in their education to teach them to do it. But as we grow up, there is a tendency to divide labour. Music and singing is for all children, but only expert adults. Stars sing, the rest of us listen. This is really too bad because everyone should be singing. Singing enhances physical and mental health by improving posture, breathing, as well as reducing anxiety, depression, and fatigue. The more people sing, the better. It also matters how you sing. Karaoke is for the attention lover. It's about taking turns in the spotlight. It's singing for individualists. The singalong is all about singing together in a group. It is a universal human social activity that touches something profound in human nature. We asked Nobu Abilman, co-founder of the runaway singalong group Choir! Choir! Choir! what makes singing together so powerful, and he put it perfectly: "At every session there's a moment when a harmonic moment gels for the first time and everyone feels it at the same time. It changes the feeling in the room, lifts everyone up, and injects energy into an already positive environment. Singing with other people is so powerful because it creates and continually amplifies the feeling of togetherness." Singing together is good for the individual and it's good for the collective because it's good for the connections between the two. And it's a lot of fun. Grown-up singalongs are rare — they are often confined to campfires and road trips — but that may be changing. Group singing of some kind is surging in popularity, and is the subject of both fictional (Glee) and reality television shows (The Choir). It also seems to be picking up at the grassroots level. Choir! Choir! Choir! is a weekly drop-in singing event based in Toronto that began in 2011, and has since performed all over the world, including at such venues as Carnegie Hall and on American Idol. Scientists do not always use the term "singalong". Often, they prefer saying "synchronous chorusing", "musilanguage" or even "Hmmmmm" (for holistic, multi-modal, musical, and mimetic). However, they agree that music is one of the first human activities. 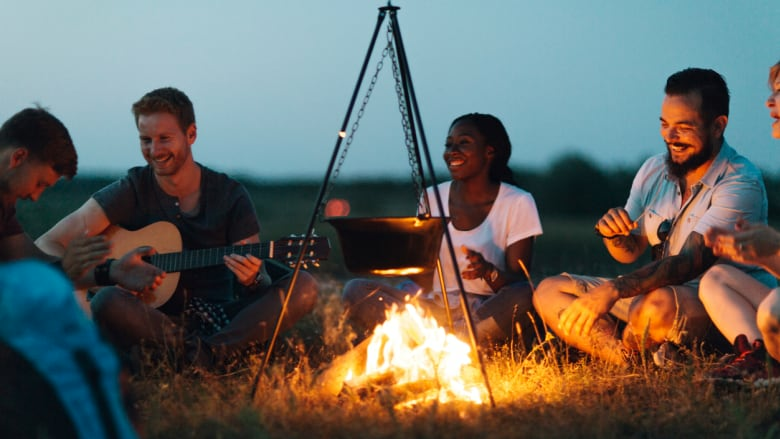 Some anthropologists believe that groups chants and song are part of what gave early modern humans the evolutionary edge over neanderthals by helping them develop tight social cohesion and group identities. Others, such as Steven Mithen, argue that neanderthals also sang together. In other words, humans have been singing together since the very beginning, and it still holds an important place in many aspects of our collective lives. Singing together is a powerful bonding experience, which is why early every religion in the world includes group singing among its rituals, and why nationalists compel schoolchildren to sing the national anthem every morning. But people also use singing together within smaller collectives; think of school fight songs and even the humble campfire sing-along. The simplest way to have a singalong is to just sing in unison accompanied by an instrument or an instrumental track on YouTube or any music streaming service. If you are the songleader of a more complex singalong, you'll need to be a relatively confident group leader. And you don't just need a song, you need an arrangement, which you can find easily enough online. An arrangement is the re-organization of a song so it can be sung in a group. There can be several voices and instruments that all contribute to the song, and therefore these different parts have to be assigned. Some people sing high parts, some people sing low parts; and a lot of people will be singing "ooh ooh ooh" or "bop bop" while others are singing the lyrics. So what you need to know is a song, and a way to divide it up between voices. Check out this video of Choir! Choir! Choir! Singing Natalie Imbruglia's "Torn" to get an idea of how this works. If you need a refresher on the basics of singing, check out this BBC guide here or check out Vanido, an app that teaches you to sing. You need enough people who want to sing. How many is enough? This depends on what you are planning on singing. As mentioned, you can sing a duet with two people or just sing in unison as a group. For more complex arrangements you will need more people. Most can be sung with four main parts: alto, soprano, tenor, and bass. For help figuring out your vocal range, check out this video. You can google around for a free arrangement, or pay a relatively small sum to download sheet music. Chorus Online has a pretty wide selection of sheet music for choirs. For tips on how to arrange a song yourself, the DK Music Academy YouTube channel provides a useful guide here. It can help to have someone who can accompany on guitar or keyboard, but it's not necessary. Pick a song that is easy to sing and that the people in your group know. If you are not working with an experienced choir, you should try to pick songs that can be sung within a limited range. Songs with a lot repetition are good. Arrange the song: divide the song up into parts. Try to stick to two or three parts, for simplicity's sake. Assign the parts: divide your group into subgroups according to the different parts of the song. How you divide the group will depend on the range in which they feel most comfortable singing. Teach the parts: sing each part with the different groups over and over until they can do it without you. Pick songs that people know and are easy to sing. Don't worry about the song coming out perfect. This is about singing and bonding, not cutting a hit record. Adilman recommends that you keep your arrangements dead easy so everyone feels confident enough to join in. Watch Chloe Charles of ECHLO leading a singalong of 500 non-musicians at the WOMAD festival here. She recommends taking a minute to explain that your singalong is not about performance or being a star, but about communicating and having fun. This can help put those who have some doubts about their singing ability at ease. Communicate the beat so everyone can stay in rhythm. You can do this with an instrument, the songleader's voice, or by conducting. Stand up straight and don't forget to breathe!